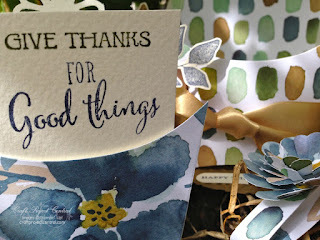 Just Julie B's Stampin' Space: Fry Box Mini Book Set! Have you ever wondered if there was more you could do with the Fry Box Bigz L Die and the Big Shot than just make little boxes? Yes you can! In this Fry Box Mini Book Set Tutorial you will learn how to use your Fry Box Bigz L die to make a mini book that you can use for recording everything you are grateful for this Thanksgiving. We will make the mini book and a holder for the book. You will also learn how to make a wonderful 3-D flower using your Scallop Circle punches. Let’s have some fun! This sweet project was made by Michelle Wecksler, and you can get her tutorial when you subscribe to the month of October over at Craft Project Central.